Google’s Pixel 2 was a good smartphone with a great camera. For the Pixel 3, the company’s bringing us a bunch of new software solutions to make the photos look even better. Google’s been incessantly talking about AI for the last year and its use of the term is a little overblown. But that doesn’t mean the software it’s integrating with its smartphone camera isn’t really interesting. At the Made By Google on Tuesday, the company showed off several handy features that’ll come with the pricier Pixel 3. Top Shot is a burst photo mode that uses machine learning to suggest the ideal photo from a series of frames that are rapidly captured in HDR. If you want the happy accident, that’s fine. You can still scroll through your options and choose your favorite image but Google’s betting on making these decisions for you. The ability to optically zoom on smartphones is highly limited and you lose quality with digital zooms. Google’s Super Res Zoom claims to use a technique taken from astronomy in which a burst of photos with slight variations based on the movement of your hand are analyzed by an algorithm. The software makes comparisons and guesses how to fill in missing information as you digitally enlarge your image. Yes, this is moving closer to a form of CGI than capturing reality, but no one will know the difference. Google’s using Night Sight to claim the Pixel 3 is the best low-light smartphone camera on the market. The feature uses software to analyze the image, select the correct colors, and brighten an image. The idea is to save you the embarrassment of being that annoying person blinding people with a flash and to give you a different option than that blown-out look that should be a style choice rather than a requirement. Night Sight will be out next month as a software update for all Pixel models. Google specifically took shots at Apple with the Group Selfies feature. 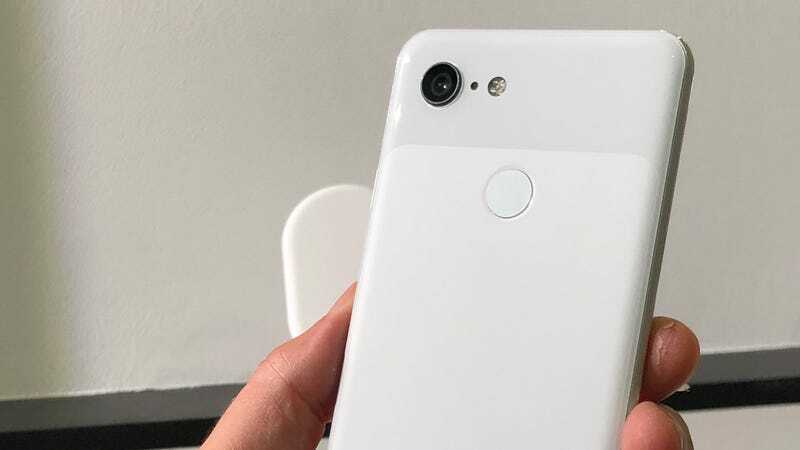 The Pixel 3 has a second camera on the front that the company claims will capture “184% more of the scene” than the iPhone Xs. The Pixel 3 also features a faster f/1.8 aperture on its “normal” front-facing camera (and a f/2.2 aperture for the wide-angle camera), compared to the Pixel 2's front-facing f/2.4 aperture. Google didn’t go very deep into what upgrades it’s made to the integrated Google Lens feature that can perform searches based on photos. The only feature that was highlighted was an ability to shop fashion items you see and capture in the real world. A simple feature that selfie-lovers will flock to, Photo Booth automatically snaps a photo if you look into the camera and smile or make a “funny face.” Presumably, users who are conscious of their privacy will be able to disable the feature. With Motion Auto Focus you can tap a subject that’s in motion and the Pixel’s camera will maintain persistent focus as it moves around the frame. With the latest iPhone launch, Apple leaned heavy on highlighting its ability to edit the depth of field in a photo. Google treated that feature as an afterthought. With Portrait Mode updates, you’ll be able to edit the depth of field, change the subject of focus, or use a “color pop” option. Finally, Google wrapped up its photo highlights by mentioning one of its most useful features: Unlimited cloud storage for photos. Preorder for the Pixel 3 is available now and Google’s website says it should ship by October 17. Updated 1:50pm ET with more information on the Pixel 3's dual, front-facing cameras.